Outside of Verizon Wireless, Bell in Canada is another carrier that seems to have consistent changes in pricing on the Palm Pre. With the Palm Pre already being available for $0.00, the wireless provider has now removed 1 and 2 year contract options. That leaves customers with the option of a getting the Palm Pre for free with a 3-year contract or buying it contract free for $295. The latter seems like a better option, but we’re thinking most consumers shop device price as the key purchasing factor as opposed to the price of the contract. Either way, Bell has great options for our neighbors up north. In case you haven’t heard, there is no lack of buzz regarding webOS 1.4. Palm has now released the update to our friends up north on Bell in Canada. Good news eh! So hit up the Update box if you haven’t already and celebrate webOS 1.4 along with that gold medal for men’s hockey. Our friends up north can now purchase the Palm Pre for the price of free. We’ve seen prices in the sub-$30 area, but it’s finally hit a price all can agree is the best you’ll find. Wireless Wave is offering the Palm Pre for free. Of course, you’ll have to commit to a 3-year deal with Bell, but you can’t argue with the price. 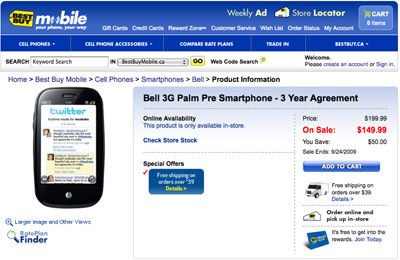 According to Mobile Syrup, Bell has dropped the price of the Palm Pre to $99.95. This subsidized price still requires a 3-year commitment. 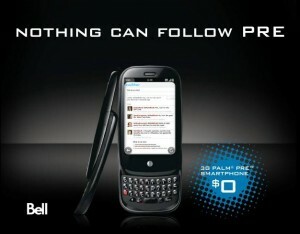 The move likely comes in response to Bell not carrying the 8GB iPhone 3G, priced at $99. Those looking for a similar price in the US should check out Amazon, with Sprint still holding at $149.99. With the Palm Pixi coming out on November 15th priced at $99, price is helping to differentiate the products. The more expensive Palm Pre includes WiFi and features a faster processor. 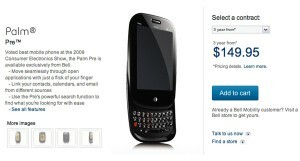 Bell in Canada has dropped the price of the Palm Pre by $50, bringing the price to $149.95 CAD. This requires a 3-year commitment and the new price does not require a mail-in rebate of any sort. 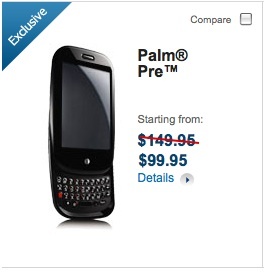 In the US, Sprint is selling the Palm Pre at $149.99, although we’ve seen some retailers smashing the sub-$100 level. Episode 4 in the “Meet My Pre” videos takes a look at Canadian athletes and their reaction to the Pre. The Palm Pre is available in Canada starting today. 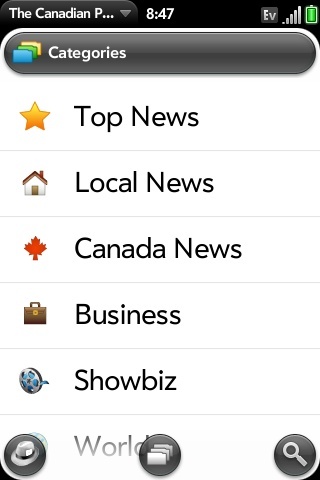 To usher in the release, Palm has updated their App Catalog to include The Canadian Mobile Press app. We’d like to welcome our friends up north to the Palm Pre and invite you to join EverythingPre. Registration is free and enables you to download thousands of Palm Pre wallpapers. Have questions about the Palm Pre? Find answers in our Palm Pre forums. 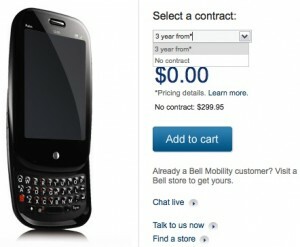 The Palm Pre on Bell is priced at $199.95 and requires a 3-year contract. To find out more information, please visit BELL. Bell has been running webisodes entitled “Meet My Pre” that are entertaining and a departure from sheer product based videos. In this episode, the Palm Pre advocate visits a nail salon. In addition to introducing the Pre to the ladies, he then proceeds to get a pedicure followed up by having his nails painted a forest green. We’re not crazy about the color, but these webisodes should serve Palm well as we suspect there is a viral element that will have more eyes viewing these webisodes.